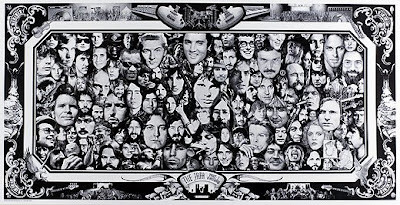 Below is a picture of a piece of artwork called "THE JAM - Part 1 - A History" which depicts faces of many great musicians from our time in a collage drawing. The idea is to see how many performers you recognize from the printed list included. For my birthday, a few months back, my wife bought this piece of art for me and I need to find the perfect place to hang it in my basement/rec room/music space. Take a look and see who you recognize from the picture. I know it is small but, give a try just for fun. Enjoy!